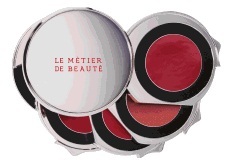 Le Métier de Beauté's Breathless Kaleidoscope Lip Kit ($95) from the Nouvelle Vague Collection for Fall 2012 has arrived, and it's on trend and stunning. If you didn't see my coming attraction for Fall 2012, you can find it here. Neiman Marcus at Mazza Gallerie has received Breathless, and I picked up mine today. Knowing that it might cloud over before I could get home from DC, I took a photo of Breathless in the store. Then I ran outside - to the entertainment of passersby, I'm sure - to get swatch photos as I stood on the Wisconsin Avenue sidewalk. A carefully crafted fusion of fall's must-have crimson and red lip tones, the Breathless Kaleidoscope Lip Kit will literally do just that - take your breath away. Blending classic Hollywood glam and ravishing 60’s edge, the sumptuous shades will leave you seeing red and craving more. From top to bottom, you'll find Cinema, a velvety, ultra-rich true red; Existential, sparkling mauve with rose effervescence; Beau, deep berry crimson with a matte finish; and Celluloid, a glimmering, creamy flushed red. I swatched on my arm in the same order as the shades are presented in the Kaleidscope, from top to bottom. I used those dinky, disposable lip brushes they have at store counters. I managed to find a sunny spot outside. Cinema, shown at the top of my arm, is an intense red that leans blue - although not very blue. Existential, my favorite of the shades, did not photograph well. It is a drop-dead gorgeous sparking rosy mauve. It's worth the entire price of admission. Beau is pure red, but leans orange on my skin. Celluloid, at the bottom of my arm, is a beautiful cherry red. It's my second favorite in this palette dedicated to red tones - the lip colors of the season. You can apply these colors more sheerly than you see them here, and you can layer them as you please, creating new shades. I will try to play with them again and show you some pretty combinations. Hi Mamaval, that makes sense. MUAs like red on me, but I always feel like I'm leading with my lips. Not my style! :) I can sheer these out and tone them down with gloss, though, so I will wear them. Oh Charlestongirl, if you could have heard me when I saw your article. "Oooooooh", all breathless like. What a GORGEOUS palette. I love every colour in it which is quite an anomaly for picky old me. Enjoy it and use it allll up. It's divine! I wouldn't have pegged this as "you," but after seeing your photo in that red dress on FB, I can see it now! Beautiful colors, but I am more of a muted colors girl. Definitely wow though and yes Red is the color of the season again.I wish I could wear Red, maybe if I spend some time looking I could find the right shade of Red for me. Fun to see you review all these gorgeous beauty must have's. Definitely makes one want to stock up on those things also. This is beautiful, the question is if I'd be happy with lip color in this format. Ah decisions, decisions! I can't seem to get as far as New York these days. Traveling past the local malls can be physically demanding, and I need to work - not take days off to play. I think this Kaleidoscope is made for the woman who loves red. I will be judicious in wearing these shades - except for the mauve rose, which is a stunner on me. Should be at a counter near you soon. Dovey, that cherry pink red could get me into red! That would be an accomplishment.